The landscape is characterised by low mountain areas with gentle terrains. What makes this area so distinctive are the many mountain valleys, ancient settlement and large contiguous woodlands that are relatively untouched by humans. Vegetation is also characterised by large marshes, sparse forest and bare mountain. Midtiklumpen 1333 m.a.s.l. is the national park’s highest mountain. The national park is located in the municipalities Verdal, Steinkjer, Snåsa Grong and Lierne, with gateways in each municipality. There are many trails here and some of them are marked. In winter there is no marked or prepared trails. You can still see traces of the old culture landscape in several places. Examples of this are: old routes, summer mountain farming, mountain- and marsh slått and Sami monuments.Blåfjella-Skjækerfjella nasjonalpark, Blåfjella – Skjækerfjella / Låarte-Skæhkere National Park is and has been a central Sami area. The Sámi have used the area for hundreds of years, and you can today see the remains of ancient settlements, collecting sites, graveyards and holy places. Within the national park are two reindeer grazing districts. This is Skjækerfjella reindeer pasturing district and Luru reindeer pasturing district. If you are interested in hunting and fishing, the possibilities are many. In the upland lakes there are opportunities for catching trout and char. The national park is also known for good stocks of grouse and forest birds. When it comes to big game elk are mainly hunted, but elk hunting is not permitted in the former Gressåmoen National Park. In conjunction with the national park, there is often talk about “the four mountain farms”. This is Holden mountain farm located in the park itself and Gressåmoen, Gaundalen and Gjefsjøen located on the border zone. Holden mountain farm is owned by Statskog who rent out the houses and The Norwegian Tourist Association has a log cabin where there is self-service. Gressåmoen is privately owned and in good condition. Vesterstuggu is open all year and serves as self-catering cottage. Gaundalen mountain farm and Gjefsjøen mountain farm is privately owned and inhabited all year, as it has been since the 1600s and 1790s. The owners offer both accommodation, hunting and fishing. Besides the mountain farms, The mountain boards, State Forest, Værdalsbruket, Steinkjer forests and the Norwegian Tourist accommodation also offer 13 cabins for rent in the national park. Verdal: Drive Rv 757 towards Vera. There are trails into the national park from Skjækerfossen, Storlunet and Vera. Steinkjer: Follow Route 762 toward Ogndalen to Lustadvatnet and Norways Geographical Mid Point. There are railway sleepers into the midpoint and you can proceed to Skjækervatnet. The park border runs on the edge of Skjækervatnet. 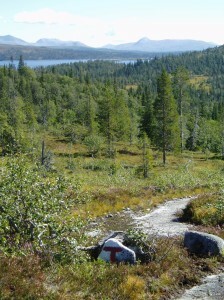 There is also a marked trail from Mokk Farm to Skjækervatnet. Snåsa: Follow Rv763 towards Snåsa and it is signposted to the national park and Grønningen by Brede. In this area there are several paths. You can also follow Rv 763 to Snåsa town centre. Exit the road towards Agle and head towards Gressåmoen. From here there are trails that go into the national park. It is also possible to get to the national park by driving to Storåsen or Roktdalen.